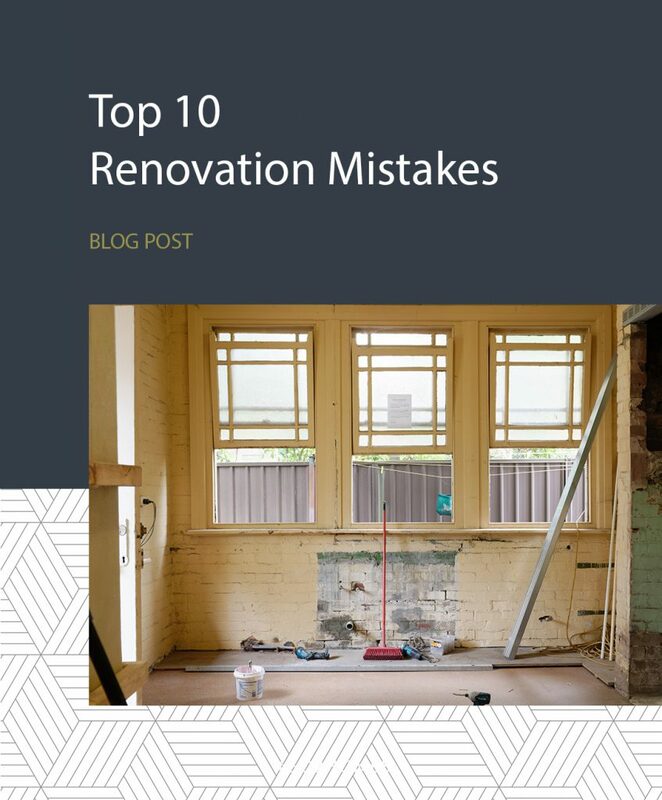 Whether you are using professionals to renovate your home or doing DIY works, below are some of the Top 10 Renovation Mistakes that you need to consider BEFORE starting your project. 1. Not using a Registered Builder to oversee your renovation works. Only a Registered Builder can provide Home Indemnity Insurance for your renovation project. Also not completing a Building Inspection by a Registered Builder prior to commencing Renovation works can risk running into costly problems during or after your renovation. It’s worth doing it right the first time to ultimately save you money and stress. 2. Not using appropriate insulation or poor installation. Having properly executed insulation is key for energy efficiency in any building. Insulation in walls, floors and your roof space can be responsible for 80% of your homes heating and cooling losses. If you have an existing or older home, your insulation would most likely need to be assessed on site with a report and plan to increase your Energy Efficiency Rating. This could save you a lot of money on your energy bills and general year-round comfort. 3. Not using a Registered Painter for painting works valued over $1000. 4. Poor sequencing of works, which may mean the removal or damage of completed elements of your renovation. This is a common mistake with DIY renovating. People get over-excited and want to get stuck in without correct planning and scheduling. Installing finishes such as bench tops and flooring before realising they need to remove other sections can cause major damage to the products that have just been installed. This also relates back to getting a Registered Builder to do a Building Inspection first. You may find leaks in the roof or other hidden damage and issues that you weren’t expecting. 5. Using different building contractors in different areas of your renovation. It can get tricky when you are engaging different contractors for different parts of your house. This involves careful scheduling so you don’t have trades turning up an unable to do the work because another contractor hasn’t finished or completed the work correctly. Having a Project Manager or Site Supervisor that is in constant communication with trades and services is crucial to saving you money and time when renovating. The benefits of getting your renovation done with a Registered Builder is they can control everything for you and they take on the liability of any delays. 6. Poor workmanship by unqualified/unskilled labour / not using skilled tradespeople. This is another common mistake when people are trying to cut costs on renovating. Going for the cheapest quote rather than basing your decision on quality and experience can actually COST you thousands. Some trades may even decline to do the work if the trades before have done a poor job. Issues such as the incorrect or poor installation of roofing or tiles could result in major water damage and risk collapsing. Your cheap bathroom extension could easily turn into a nightmare. And if the trades were not Registered you might find it hard to claim compensation. 7. Not understanding the ‘complete picture’ or the desired outcome. Focusing on specific aspects and not taking into consideration how the space will be used and by who, often leads to frustration after a renovation is complete. For example, you want a large bench top with a breakfast bar. Focusing on that and getting a beautiful kitchen installed only to realise you don’t have enough room to walk past or your young kids need to sit at the dining table so the breakfast bar is not used. 8. Not having a completed a detailed design/planning. It’s important to have a detailed design and planning schedule to get everything right from the start! It also means you can give it to trades to work off knowing they will be installing and working to the correct scale and measurements. This creates a cohesive workflow with everyone involved and saves you thousands by not having to rip things out and replace. 9. Non-compliant works in accordance with the Building Code of Australia and/or Local Statutory Authorities. Codes and Standards are required to maintain minimum necessary standards of relevant safety, health, amenity and sustainability within the industry in relation to all building services (plumbing, painting and building work) regulated by the Building Commission. This ensures you aren’t at risk of causing damage to peoples property or safety. 10. Using the wrong materials for the area or application. Western Australia has harsh climatic and weather conditions. So, it is extremely important that the right materials are used for the property’s location. Will it be affected by salt air? Is it subject to extreme heat? Does it require wind or cyclone rated materials? There are specific guidelines and regulations to follow which will ensure your building or renovations will withstand the climatic conditions. Planning a renovation correctly and using Registered Builders and trades will save you money and stress, so you can just enjoy the process. Do you want your renovation completed by experienced Registered Builders?